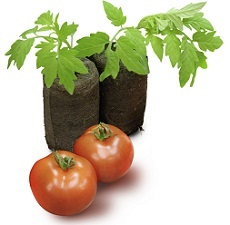 Growing your own plants is fun, rewarding and very cost effective. Spring is the perfect time to arm yourself with a few essentials and get propagating. soak the pellets for a few moments in water until they swell up, then insert either seeds or cuttings and leave them to it. Using these reduces transplant shock, which is a common reason poor results occur. Seed: Always use fresh seed. Packets that have been opened for a long time are unlikely to come to much. Cuttings: Select only the best stems of fresh growth and aim to make the cuttings all the same size. Finger length or up to 10cm is ideal. Ibadex Powdered Rooting Hormone can be used to trigger root formation. Water: Aim to keep the soil moist but not wet. Like baking a cake, ensuring a good outcome means using the right ingredients. Apply the same philosophy to propagating, and your results will speak for themselves. Propagation house: These are the best inventions. They speed up the germination and root development remarkably. They are small enough to easily fit in a sunny corner on the patio or indoors. Essentially these are miniature greenhouses. They are lightweight, portable and easy to use. Even better, the ventilation system on the Oderings ones allows the seedlings to get plenty of air. 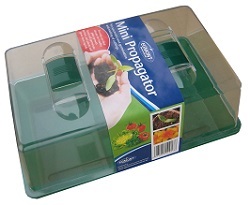 Seed and cuttings trays: Look for these seed trays in-store. Some recycled shallow containers with drainage holes can work too. 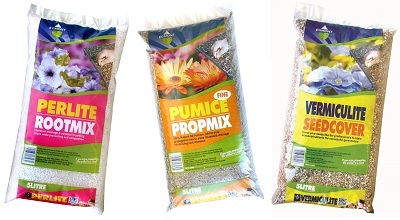 Seed raising mix: Either make your own using pumice, peat and perlite, or get some new fresh seed raising mix. Cover sown seeds lightly with Vermiculite; this acts as a blanket, keeping heat in and disease out. Labels: To write the seed’s name on. Sounds silly but it isn’t. Labels make it easy to remember a few months down the track what seeds or type of cuttings you have. 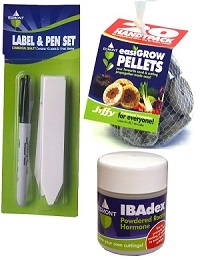 Jiffy pellets: Use these for seeds that are easy to handle in your fingers, for example, tomatoes, chillies and sunflowers. And kids love seeing the pellets swell with water. Sensitive crops such as tomato, chilli, cucumber, courgette, eggplant and capsicum can all be planted in a mini propagation house, ready for planting out once the frosts have finished. Beetroot, lettuce, onion, cabbage, cauliflower, broccoli and celery can all go in too; these do not need quite as much warmth to germinate. Alyssum, Petunia, Granny Bonnet, hollyhock, marigold, sunflower, cornflower, Aster, sweet pea, nasturtium, Cosmos and Zinnia. Spring is a good time to take cuttings of Hebes, lavender, Buxus, lemons, succulents, Lonicera and Camellias.